John Siebeling addresses 10 areas in our lives that may be holding us back and how to tackle them to move on in in his book, "Moving Forward: overcoming the habits, hangups, and mishaps that hold you back." Each chapter addresses something different, including a chapter on blaming others, another chapter on worry, another on anger. Each chapter is jam-packed with wisdom and tidbits of truth to take away. Each chapter ends with an Evaluate/Eliminate/Elevate section, asking questions and giving ideas and tasks to take that step and move forward. I found this book easy to read and follow. While there is a lot of information included and a few of the topics are "heavy" and can be hard to think about and address in our own lives as it is not something that is easy to admit we struggle with, it is important to address in order to really move forward. John addresses each topic in such a way that it is non-threatening, but straight-forward and encouraging. I highly recommend this book for those whom are hoping to make changes in order to move forward this year, and what better time to start than now! This book is exactly what I was hoping for when I received it! How many of us live our lives day to day, week after week, doing the same thing surrounded by friends, family, community members, people in general. However, at the same time how many of us feel all alone, even in the midst of so many people. 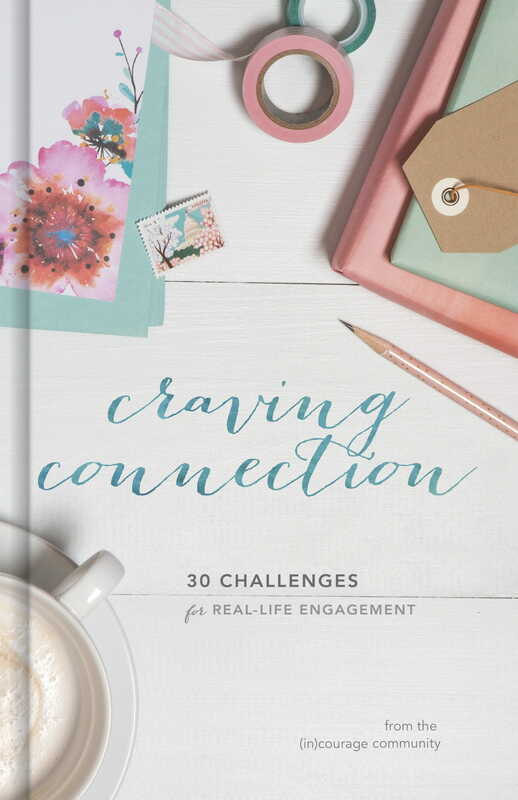 "Craving Connection" is filled with 30 readings, and challenges to push us to make a connection, a connection with God, a connection with a friend or a connection with one's community. Each chapter has a highlighted verse, a reading written by someone a part of the (in)courage community, a prayer, a discussion question, and a challenge to help make a connection. This book is also beautiful. The colors in the book are soothing, the layout is so cute making it look as if the quotes and questions are taped onto the page giving it a crafty, scrapbooking look. "Craving Connection" is a book that will find a permanent home with me and will be read so many times I am sure. It is such an encouraging book and one that is helping me to create and reach out to really engage and create connections with others. Candace Calvert's most recent novel. "Maybe It's You," is an incredible read! The readers come so alive and the storyline is gripping, it is hard to stop reading once you start! Sloane has started over, I mean really started over with a new name, a new place, new everything and to maintain this life she cannot get close to anyone. However, this becomes challenging when Micah is trying to do his job and Sloane has caught his attention for what he is hoping to do. Each of these two characters are dealing with issues from their past and are trying to do what is right and live their lives. Sloane has unfortunately lived a rough life and she cannot be found; these are issues that are sometimes glossed over, but they are so real and it is important that they are addressed as so many are facing rough situations such as Sloane's. Candace weaves together such a great story and intertwines the characters' lives and really just writes with heart. I found myself immediately drawn into the story and into the characters' lives that I found myself empathizing with them, cringing, cheering and hoping for a happy ending! *Thanks to the Tyndale Blog Network for the complimentary copy of this book. *"
Candace Calvert is a former ER nurse and author of the Mercy Hospital, Grace Medical, and Crisis Team series. Her medical dramas offer readers a chance to “scrub in” on the exciting world of emergency medicine. Wife, mother, and very proud grandmother, Candace makes her home in northern California. Please visit her website at candacecalvert.com. 1. Maybe It’s You is the third installment in your latest trilogy, the Crisis Team series. What is the background on this series? The Crisis Team series features the selfless and compassionate work of volunteer community chaplains—true heroes, in my opinion. The stories are set in my native California, this one in the “City of Angels,” Los Angeles. 2. How do you expect this series to resonate with your audience? What are you most excited for your readers to experience through reading these novels? I love that my readers agree crisis responders are very special heroes. Because these selfless men and women are volunteers, it’s fun to show how their day jobs differ from what they encounter when they pull on those volunteer jackets. The hero of Maybe It’s You is the hospital’s public relations guy: coat, tie, media-speak, very different. As with all of my series, the Crisis Team stories are hospital based. Readers will feel as if they’ve been dropped into the adrenaline-infused action of the ER, experience team camaraderie, taste that day-old coffee—and glimpse the good hearts behind the stethoscopes and badges. 3. Crisis teams are becoming increasingly vital and active in the world today. How would you describe their role, and how can we learn more? 4. As a former ER nurse who has had crisis chaplain training, what has been your most rewarding or memorable experience in the field? In my role as a CISM (Critical Incident Stress Management) peer counselor, I was part of a team that ministered to fellow medical team members affected by work-related tragedy. We responded to (and conducted debriefings for) hospital staff after situations involving infant and child death, mass casualties, personal assault, and accidental death (or suicide) of fellow team members. One of the more heartbreaking situations I dealt with involved a hospital ER team caring for a critically injured youngster—who was the child of their favorite trauma surgeon. 5. What was your inspiration for Maybe It’s You and the main characters, Sloane and Micah? Interestingly, I never intended to feature Sloane Ferrell as the heroine of Maybe It’s You. In Step by Step, she is the nemesis teammate to the story’s heroine. She’s cynical, troubled, and dare we say unlikable? Probably. And rather mysterious, too—for very good reason. As an author, crawling inside Sloane’s head was a challenge. It raised more questions than answers. I suddenly needed to know why she was the way she was. And what it might take to change that. As this third story opens, Sloane has a new name, new zip code, new job, and a life-and death need to keep a low profile. But the opening scene puts our reluctant heroine in the media spotlight and at serious odds with Micah Prescott, the hospital’s equally determined PR man. The unifying message in Maybe It’s You is one of forgiveness and healing, brokenness and worth—that no matter our mistakes, we are loved by God. Saved by grace. 7. As an author, what did you particularly enjoy about crafting this story? I have been known to randomly invite readers into my stories—as characters. It was especially fun, this time, to feature the husband of one of my readers as hospital worker/handyman Jerry Rhodes; from what I’d learned of him on Facebook, he seemed a perfect match. My reader and I had a great time getting the details right, and in the end, I also “borrowed” her adorable doxies, Gibbs & McGee, her dear, elderly mama—and then I invited this generous reader to make a cameo appearance of her own. I think you’ll agree they were a great addition to the story. 8. What are some of the unique challenges of writing contemporary romance in a medical setting? I think the challenge of the medical aspect is to provide realistic (and accurate) medical detail without talking over the heads of readers, but not talking down to them either. Because of the popularity of medical TV drama and the opportunity for people to google their way into medical jargon, symptomology, and treatment adjuncts, readers are far more savvy these days. I try my best to sort of parachute my readers into the medical scenes, allowing them to feel as if they are part of the team. As far as the romance aspect goes, while it’s true that teammates working in life-and-death situations often develop strong (and sometimes romantic) bonds, I can guarantee there are no TV-type trysts going on in hospital storage rooms! 9. Have you received any feedback from your fans on the Crisis Team series? How are they responding? The response (I’m grateful) has been very positive; readers love these compassionate crisis responders. And of course, I’m so honored that Booklist chose this series’ first story, By Your Side, as a Top 10 Inspirational Book of 2015. 10. What is the best advice or encouragement you have received either personally or professionally? No better encouragement for any author. 11. What are you most proud of in your writing career? I feel really good that I’m a trailblazer when it comes to medical romance in Christian fiction—I love being called the author of “medical hope opera.” That my long years as a nurse are now the basis for stories that touch readers’ hearts, offer hope, and perhaps even healing, seems so right, God’s plan, for sure. I’m definitely proud of my publishing team—Tyndale House is beyond awesome. 12. What are some future projects you’re working on? After completing these three books (and now three medical fiction series), I’m currently enjoying some R & R: gardening, traveling with my husband, and volunteering in our granddaughters’ classrooms. I’m a “Sight Word Buster,” a program that boosts reading skills. An author shaping new readers—how cool is that? I received these "Amazing Animal Facts" postcards and these far exceeded my expectations! Each of the 50 cards are different, featuring a different animal and each can be colored. There are 5 categories that the cards are sorted into by where the animals live: sea, forest, field, jungle, sky. On the front of each card is a picture depicting the said animal with some facts shared about it. On the back side there is ample space to address and write a message on the card. However, there is also more information about the animal as it shares the class and order of the animal as well! These animals range from blue whales to flies to hummingbirds! My two children (ages 6 and 8) were so excited when they saw these and they loved the box (case) that the cards are stored in. They immediately sat right down to look through the cards to see what animals are included! I am pretty sure that these will not be leaving my house, but will be colored and looked through over and over again! For more info on this product, go here! To learn about the creator, go here! Return to the story of Jesus and read it from a new perspective in Keith Korman's Eden: The Animals' Parable. In this beautifully inspired retelling of the Gospels, we see Jesus and his disciples in the Holy Land through the eyes of the animals-especially his intrepid and loyal dog, Eden. Simple, clear, and spiritually profound, Eden is for readers of all ages, this artful retelling is captivating, moving, and alive with the joy you felt the first time you opened the Bible. Settle in for some winter reading and enter to win a copy of Keith's book and a Kindle Fire! Enter today by clicking the icon below, but hurry! The giveaway ends on January 24. The winner will be announced January 25 on Keith's blog. In this beautifully inspired retelling of the Gospels, we see Jesus and his disciples in the Holy Land through the eyes of the animals---especially his intrepid and loyal dog, Eden. With a wise, old donkey, innocent lambs, and legions of curious field mice---the animals follow their master's journey across Galilee and onto Jerusalem, rapt with awe and wonder and bearing great tidings---even if they don't fully comprehend the divine events they witness. Keith Korman is a literary agent and novelist. Over the years he has represented many nationally-known writers of fiction and non-fiction at his family's literary agency, Raines & Raines. The idea for Eden first came to him as a child when he saw the little calf jump across the stable in the prelude to William Wyler's Ben Hur. And he's been thinking about it ever since. "Eden: The Animals' Parable" was such a fun, and touching read. Told from the perspective of animals, the reader is taken through the gospels seeing them in a completely new light. The stories that are shared are more than just stories; they are a retelling of Biblical accounts and a way to introduce people to the Bible and the truths within or bring someone back to the truths offering a new perspective and reminders. The book is written in such a way that it flows nicely and makes the reader seem as if they are right there with Eden and the others. Eden is very devoted to Jesus and has been with him through childhood and his journeys and interactions with people in His ministry. Eden is a great example of unconditional love and devotion to Jesus and also looking at and seeing people for who they really are inside, not just what people see with their eye at first glance. This is an interesting read that will be sure to delight. Would you rather be liked online—or loved in person? Social media can be great. But for girls growing up in a generation saturated with social media, getting enough “likes,” comments, and online friends can become an unhealthy obsession. In Liked, Kari Kampakis offers positive and powerful insights to help girls navigate the digital age. Applying God’s timeless truths to modern realities, this unique resource dives deeply into topics like social media, friendship, identity, and faith—while ultimately encouraging habits that lead to real and lasting relationships. Who am I? What is my purpose? How can I change the world and make an eternal difference? How can I love myself when I feel unlovable? For anyone tired of the quest to impress—and ready to rest in God’s unconditional love—Liked is the answer. This book is a conversation-starter that will quickly unite mothers, daughters, sisters, and friends by speaking to the female heart and addressing the need for approval with wisdom, hope, and grace. "Liked" is a must-read for parents of pre-teen and teen girls! In today's society, social media is such a big thing and it does become an obsession as far as how many friends and "likes" people can get on their pictures. While this can be an issue with boys as well, it more seems to be more of a hot topic with girls as they tend to express more of their unhappiness with body image and just how they feel about themselves overall, not to mention how sexualized girls are at young ages. Kari does a great job with diving into this issue and offers ways to connect in person, most importantly how mothers and daughters can connect and offer wisdom with being safe and smart on social media, but most importantly feeling good and comfortable with yourself and how God has created you. Laura Frantz takes the reader back in time to the frontier of Kentucke in the late 1700s and the lives of strong, brave individuals with pasts and secrets. The Tucker family has settled in at an inn, and while the family has secrets, Tempe is also guarding her heart. Tempe is hired to lead a group through the wilderness as she is the best in the area for knowing the area and has strong survival skills. While this is unusual for a woman, Sion wants the best to lead his group and he goes along with the plan. Laura writes in such a way that it is so easy to become lost in the story and transported back in time to a life so different from today, yet it comes so alive and real. I love how the setting comes so alive from Laura's descriptions, it is easy to picture various places on their journey, the inn and the path they took. History is woven into the story, both events and individuals and this just adds so much to the story. I highly recommend "A Moonbow Night" for those whom enjoy historical romance fiction! "60 Days of Happiness: discover God's promise of relentless joy" is a 60 day journey that is sure to change your mindset and your life. Bestselling author Randy Alcorn shares his thoughts and carefully selected Biblical passages in order to show that God wants each and every one of us to live both holy and happy lives. Each passage is a short read, yet each one is still thought-provoking and in-depth on the subject. This book is seriously a great way to begin each day or take a few moments out each day to refocus on the wonder of each day and the joy and happiness that can be experienced in every day life and also help turn the focus back on God. This book is a nice, small, hardcover edition that can be tucked into a handbag and taken anywhere to sit, read and reflect. "31 Women of the Bible" is an absolute wonderful little devotional book that highlights 31 different women whom today's women can learn from. Each woman has her own section that is beautifully displayed with colorful illustrations, highlights of her story that is shared in the Bible and last but not least things that can be learned from her. One of the highlighted women is Ruth, whom is labeled as the "dream daughter-in-law." The takeaway from Ruth's story is how there are difficult relationships in our lives and how to approach these with grace and seek forgiveness and make amends as needed. I really enjoyed the Takeaways for each of the stories that are shared and the reflection questions as they were thought-provoking and made me think about changes I need to make within my own life to be a better person. This is a book that I will revisit often I'm sure. "Buried Memories" is the latest read from Carol Post and it is a page-turner that will keep you up way past your bedtime reading! Nicki was hoping for a fresh start and is trying to move on with her life after the broken engagement. However, she discovers that someone is out to get her as her home is broken into and odd messages are left in the chaos. Also, Nicki's former best friend is also back in town as he is helping his brother; however, Tyler has his own past that he is trying to start over and move on from. As Tyler and Nicki find themselves working together to find out whom is behind the scares and why, why now and what is the purpose? Carol writes in such a way that the characters come to life and the reader is completely immersed in the story. I found myself completely wrapped up in the story and in Nicki's and Tyler's lives. I felt as if I was transported to this town and was a part of the drama. I highly recommend this for those whom enjoy romantic suspense; be prepared for some fast-paced drama!